55th Wedding Anniversary Favors. 1960 Year Magnet. 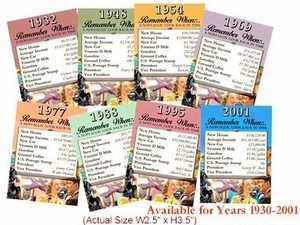 Please the golden anniversary partygoers with these 55th wedding anniversary favors. Our 1960 year magnets are 2.5" w x 3.5" h and shows 1960 and the top facts. Great 55th wedding anniversary party favors! Cost is per magnet and is inexpensive enough that you can do one for each person attending the special event. If you like, use them also as 55th birthday favors as an alternate idea. We are one of the few places that carry these, so load up before we run out of these interesting favors. See also our other 55th gifts.